Talking about macho, this monster is sure to add adventure in your life. Entirely in shaded black, the details give it a 3D appearance, whereas the eyes and teeth can haunt your nightmares for days to come. Not everything macho has to be terrifying, and this design proves it. Bold, powerful, and incredible, it has a quiet yet irresistible appeal. Moreover, the culmination into flames around the back of the neck and skull only add to the masculine nature of the design. Bring adventure to life on your bare back. This is a hyper-realistic, three dimensional wonder depicting a man just before he is about to jump. The tattoo, which is detailed in shaded black, can set your heart racing with trepidation. Our lives are devoid of excitement, for the most part. A goblin on the back, however, can change all that. Created in shaded black, this little creature comes to life with a penny and a pipe. Moreover, the terrifying branches and the mushrooms which form his seat only serve to highlight this surreal scene, while the bats in the background symbolize black magic. Tattoos are all about letting your imagination free. 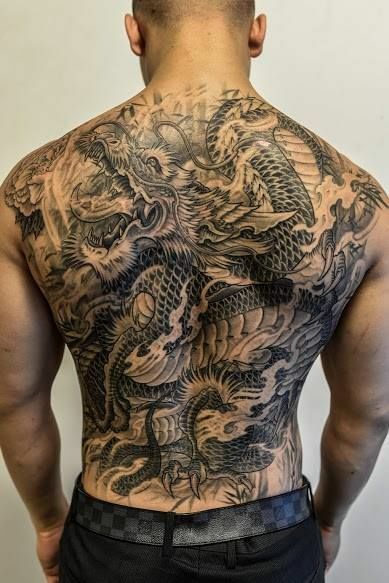 This back tattoo is as masculine as it is beautiful. 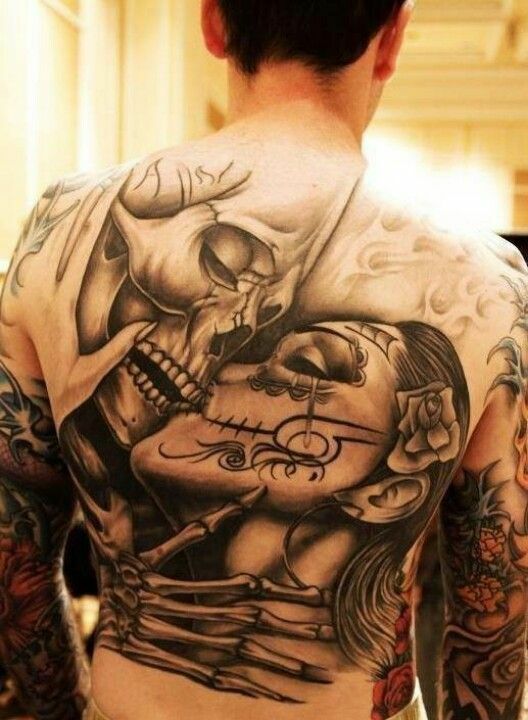 With the skull kissing a woman, her live face is decorated with the mask of death. Her skull is depicted through the stylized lines covering her skin, a reminder of the frailty of life itself. Ravens have always symbolized foreboding. This realistic collage of images, which include a woman’s face, a letter, and two ravens, is sure to make heads turn. 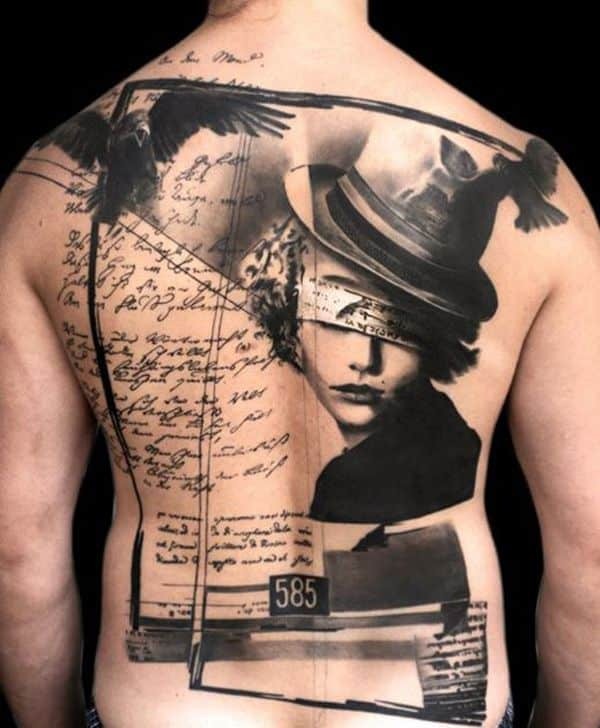 A great back tattoo for men, this one depicts mystery at a glance. The crucifixion, sorrow, and suffering of Christ is perfectly captured in this tattoo design. 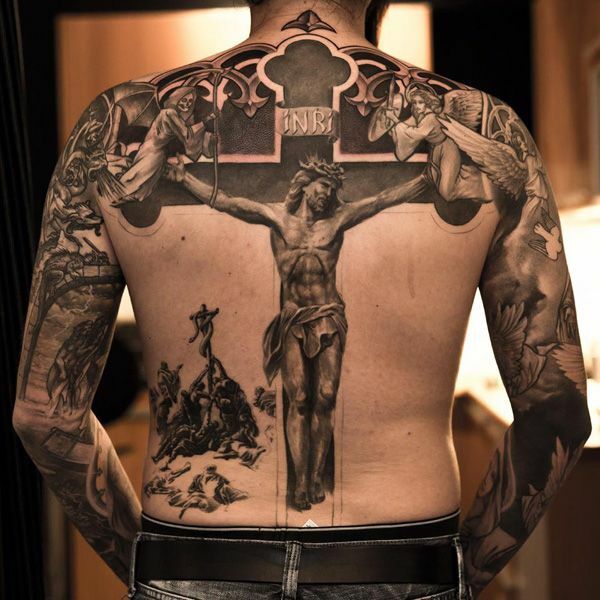 While depicting the savior nailed to the cross, the tattoo, which continues to cover the two arms, is extremely detailed. One can even see death and an angel lurking over Christ’s head. Moreover, the extremely beautiful design on top adds life to the image. Our time is limited, and the clock is ticking. 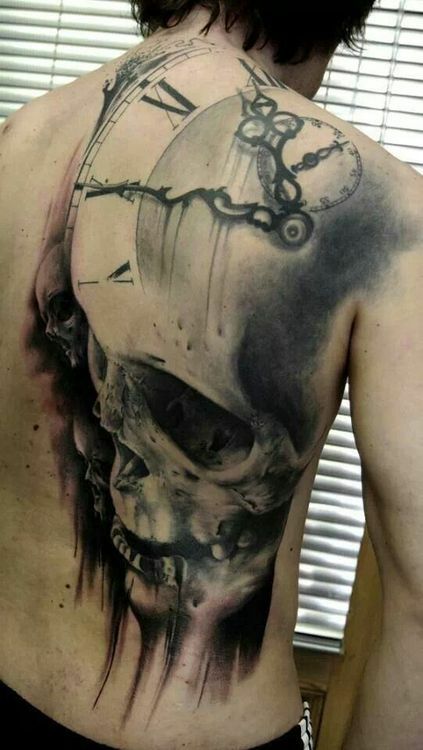 This skull, whose head becomes the form of a clock, is a continual reminder of that. 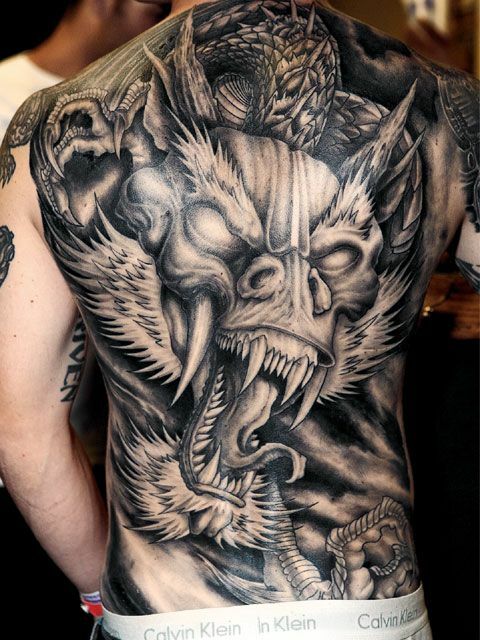 Covering only the top corner of the back, it is a beguiling tattoo idea for men. The crimson shade towards the edge contrasts well with the black in the rest of the tattoo to depict the fleeting nature of life. What could be more fabulous, masculine, or fantastic, than a powerful dragon? 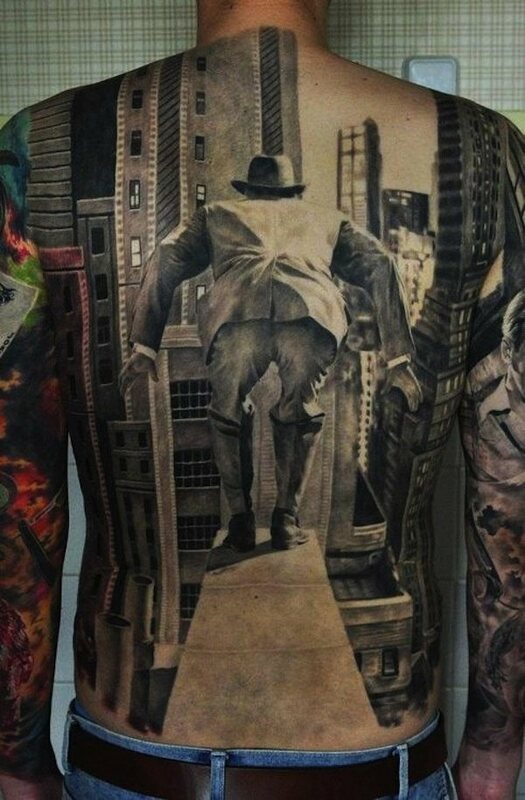 A masterpiece in itself, this back tattoo is guaranteed to give you the chills. Each scale is created to perfection, and the Chinese dragon’s head exudes complete power. As you stare at the life-like image, you will be left waiting for the dragon to breathe fire into your face – the sparks of which are still ripe on his tongue. 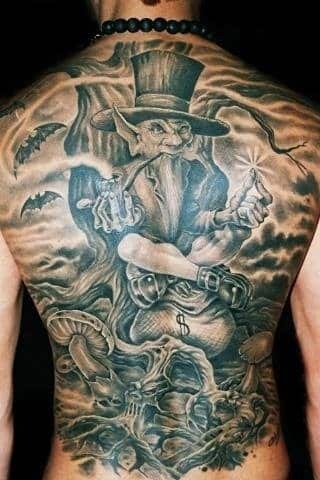 The beauty in the dreadful is emphasized in this incredible tattoo. Here, you see a large skull lying in a bed of roses, the dew drops still fresh on its forehead. It is a reminder of the passage of time. Despite its morbid depiction, there is a subtle beauty in the scene. 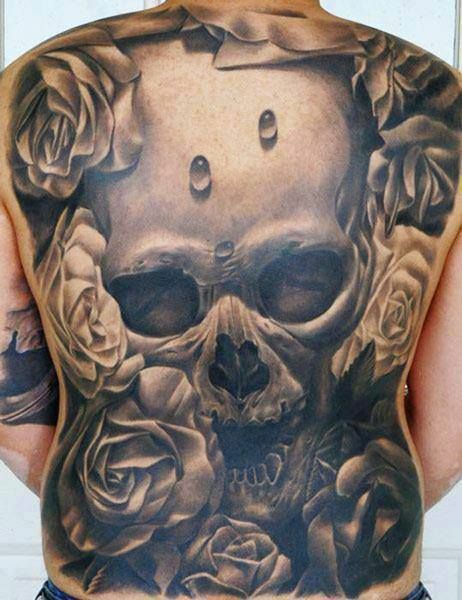 Done in shaded black, this tattoo is outstanding.